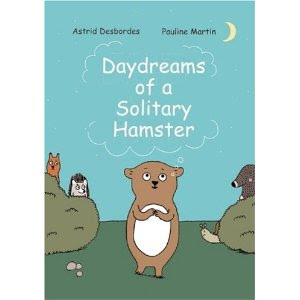 Daydreams of a Solitary Hamster by Astrid Desbordes. Illustrated by Pauline Martin. Enchanted Lion Books. 2010. Picture Book. Review copy supplied by publisher. The Plot: The friendship of Hamster, Mole, Snail, and other animals. The Good: Comic strips make this a picture book with appeal to older readers; which is good, because the humor here will go over the heads of most four year olds. Hamster is wonderfully, blissfully, egocentric. When he looks at the stars, he doesn't stop with thinking they are beautiful and mysterious; no, the stars must, in turn, look at him and think not just that Hamster is beautiful and mysterious but that "seen from space, a hamster must be a magnificent sight." Hamster not only sleeps outside so that the stars will be happy as they contemplate him; he spells out his name, Hamster, in rocks, so they know who he is from a distance. And it's philosophical! Here is Hamster mulling his favorite food: "I love waffles so much! The fear of running out of them haunts me. This love will stay with me forever and ever. That's just the way it is." Who hasn't thought that about love? Oh my gosh I want this book Now. Sounds like a perfect marketing fit with all the hamster toys out there these days, too.